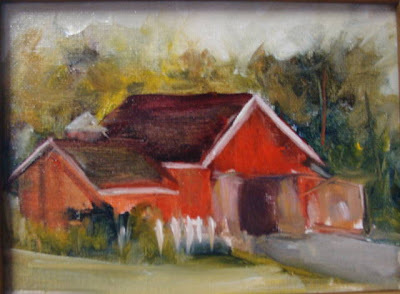 4x6 oil sketch. Working on this one, I like the idea of it, don't know if I can pull it off, but I will try. Painted with the SBAA ladies, this was in Stony Brook. I don't know why the greens look so yellow, I will have to take a better picture. 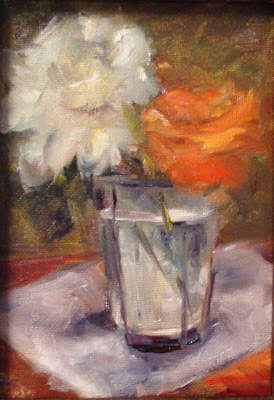 This is a 5x7 oil on canvas panel. 8x10 oil on canvas board. I started this one in my studio. I will try to finish it within the week. It's to Avalon in Stony Brook tomorrow. 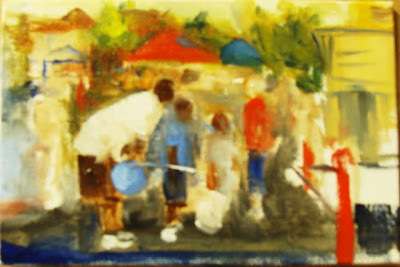 Looking forward to painting with some people from the BAHC. What I love the most about painting on location, is the freedom of expression. Went back to Longwood to finish this painting. It was hot and humid, well anyway, this is the finish product. 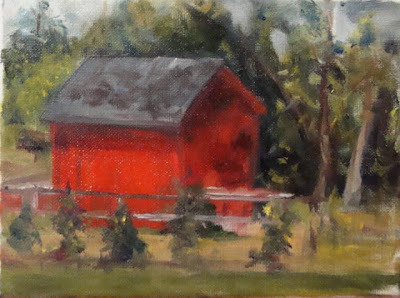 Yesterday was another plein air day at Longwood. I can't begin to tell you how many wonderful sites are at our disposal to paint. Not only the barns and victorian buildings, but a lake. The grounds are magnificent and well kept. The problem, I didn't have much painting time. 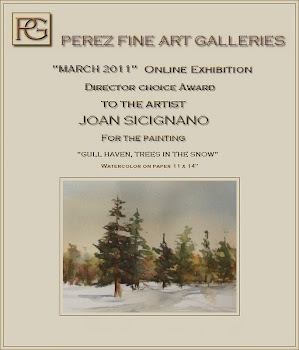 I had to be at the Apple Bank to hang my paintings. Well all that being said this is what I managed to paint. 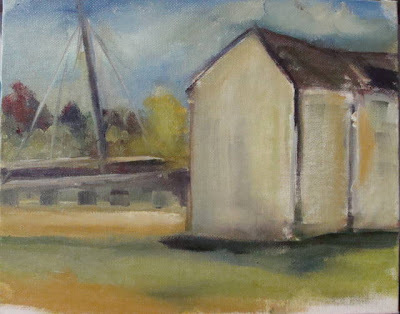 Once again, I'm really addicted to plein air painting. I'm finding it very difficult to paint in my studio. Taking Cathyann's advice and moving on. Back to the Kevin Macpherson's one hr. challenge. 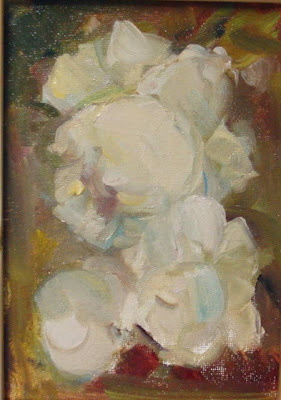 6x8 oil on canvas mounted on foam board. "As the Stomach Turns", well as you can see not having much luck with this painting. Decided to finish in the studio, lots of angles going in the wrong direction and color is getting muddy. I wont give up on it, will fight to the end. First a nap is in order. My first sketch on Tuesday. Mike suggested that I wear his amber sunglasses. I know, it affects the color and it did. But oh what fun. Didn't have a clue how it was coming along until I removed the glasses. 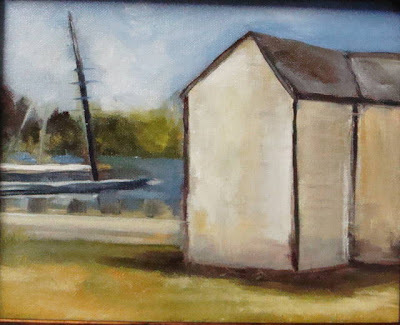 So I will go back and complete these two painting on location. It was delightful except for the hot humid weather. 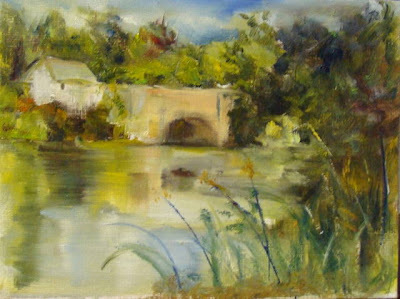 Quite a few people from SBAA were there, I am getting so addicted to plein air painting. This was the second one I started on Tuesday. It was really a quick sketch the heat was stifling . A gentleman was chatting with Mike as I painted as fast as I could. It has possibilities. I will go back and finish both painting on location. Work in progress. 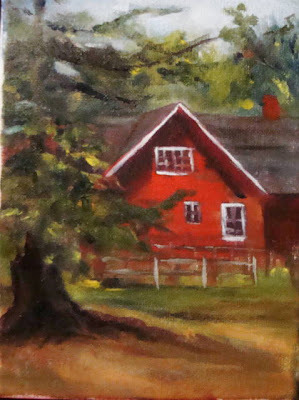 I painted this outdoors, it is a 5x7 oil on a canvas panel. 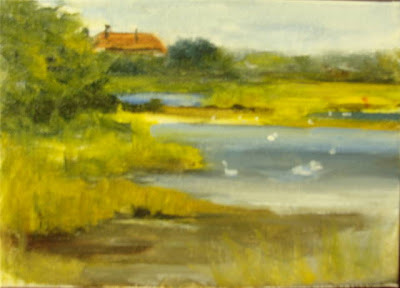 BHAC invited Long Island artist from the SBAA to paint plein air at Longwood. It was wonderful, got there late, it was raining and I didn't get a chance to meet the other artist. 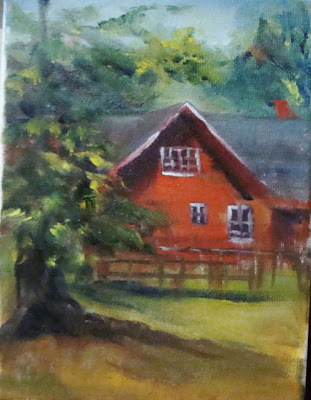 I painted in oils and didn't mind the rain at all. This is 6x8 sketch, still keeping with the Kevin Macpherson 1hr. studies. I met to lovely ladies, Debbie and Diane who maintane and care for the estate. It was a great day. Work in progress, started this after my previous disaster. Using flake white mostly, I think the flake white is warmer, not chalky. Any suggestions out there? I kind of like the look of this white, just need to practice. What went wrong? 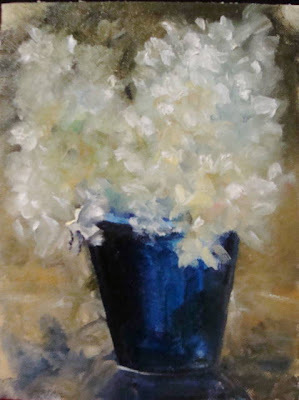 Staying true to the 1hr daily painting, today was a total failure. I used flake and zinc whites, I failed to do an under painting. That works for the master artist Alex Perez and I am sure most of my fellow artist bloggers. But for me, more studying ahead. I have taken up the Kevin Macphersons challenge. 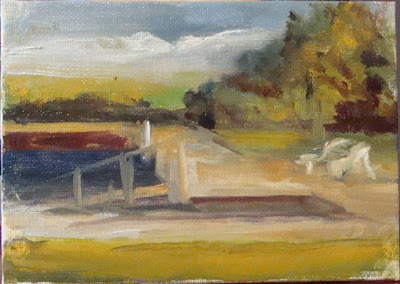 1 daily 6x8 painting in 1 hr, using the primary colors plus black and white. 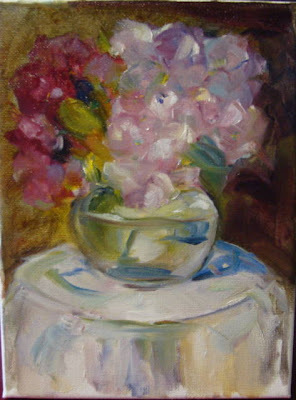 This time I painted in oils, wow, I love this medium. The little bidge in the Ward Melville park in Setauket, Cathyann, I am sure you know this place. It's a beautiful park. 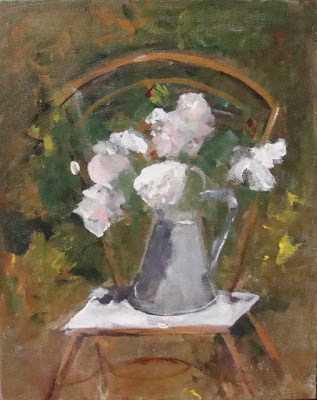 Although I did not paint this on location, it was done in the studio from photos I have taken. This an 8x10 acrylic on canvas panel. 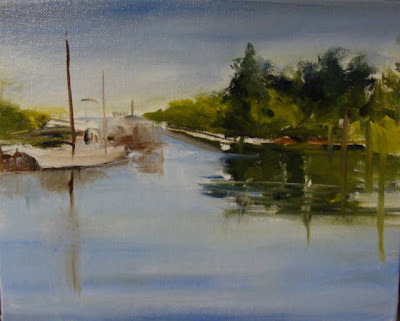 In Kevin Macpherson book on plein air he suggest doing plein air studies in 1hr. Believe it or not, I got into trouble the last 10 minutes. All in all it's wonderful painting that fast, the mind can't interfere , well almost. Oh, he also suggest just using primary colors.